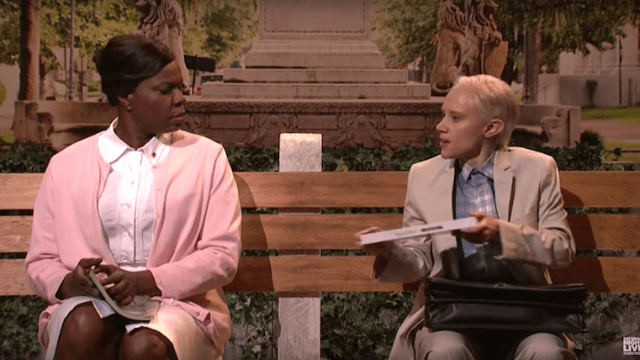 Kate McKinnon as Jeff Sessions as Forrest Gump is the 'SNL' cold open we needed. At this point, SNL's Kate McKinnon has probably done an impression of more of Trump's cabinet than not. Okay, maybe that's an exaggeration, but it's impressive that she has been able to handle tapping into the psyche of so many horrible rich white people without losing her own mind. And the latest iteration of her masterful impression work comes in the form of Jeff Sessions (a character she debuted when Melissa McCarthy gave us Sean Spicer, bless them both), as Forrest Gump. Now that is some comedy with layers. I do not know what writer said, "hey Jeff Sessions drawl and simple mindedness reminds me of Forrest Gump," but man were they right. And SNL masterfully mapped Sessions recent actions onto the iconic scene from Forrest Gump. "I always say life is like a box of chocolates… Sure are a whole lot of brown ones in there," Sessions says to the lady at the bus stop with him, who's barely giving him the time of day. The delivery of Sessions racism in character as slow-witted Gump is hilarious; it points out just how out-of-date and backwards Sessions beliefs are. When Sessions dives into his recently revealed contact with Russians, it gets even funnier. Sessions says his week started out pretty good, due to the President's first Congressional Address. "Folks were thrilled on the account that it was real words in a row for a whole hour," he said. "But then I went to bed, I got 800 messages and phone alerts saying I was a sneaky little liar. I didn't know what to do so my lawyer said 'Run, Jeffy, run.' I started running and running."